Tom Gentile writes: Twitter has often been dismissed as a company that should have sold out to Facebook (Nasdaq: FB) years ago, and until recently no one really wanted to own its stock. I disagree. I believe now is the right time to buy Twitter Inc. (NYSE: TWTR) stock, and not just because it's starting to show up on the Street's buy lists. Even so, as a rules-based trader, I need hard evidence that a trade will be worthwhile. And I just got it for Twitter. Let's have a look at the catalyst that's going to fatten our wallets while everyone else waits for the wrong signs. Then I'll show you how to fuel your returns with an options strategy that could boost your profits to upwards of 300%. 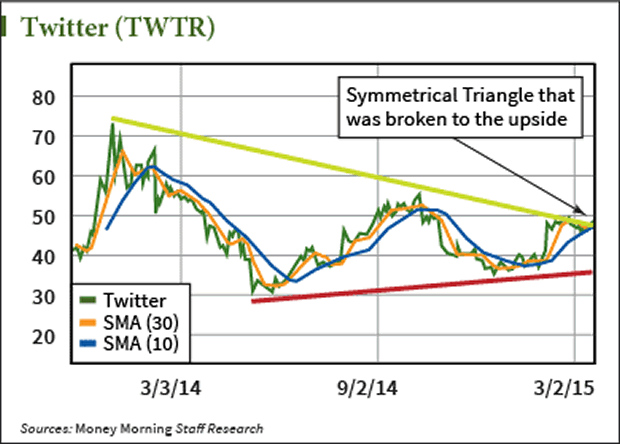 First have a look at a long-term chart of Twitter stock performance. Notice the red support line that is drawn on the chart. It goes from a stock price of $30 per share back in May of 2014 and rises through the latest support point at $35 per share in January of 2015. We call this a rising support line. Now take a look at how the green resistance line on top of the chart is falling. The latest two resistance points are $55 back in October of 2014 and the latest resistance price of $50 just last month. Put both of these lines together and you see that resistance is dropping and support is rising into a triangle formation. This "Triangle, Wedge, or Pennant" pattern clearly shows that the highs are getting lower, but the lows are getting higher. This can't go on forever. Any chart pattern like this eventually has to break, either to the upside, which is bullish, or to the downside, which is bearish. Lucky for us, Twitter has just decided which way the break is to occur… to the upside. Fundamentally, things are looking up for Twitter. First, it has put in a few better-than-expected earnings reports and, based on the last one, its stock is now finally reacting to the good news. The last report was followed by a bullish gap in the stock price, which is now serving as short-term support at $45. There seems to be some momentum to the upside as Twitter has just closed above its highs for the year. I also like to look at social trends as they relate to the fundamentals of Twitter. I believe that social trends come in two cycles: First the teens, then the adults. Think of our teens as beta testers. They want something new and cool, and if their parents don't know how to use it, even cooler still! While teens are very sticky and will sit on their favorite social site for hours, they aren't the best targets for advertising. First they don't have much discretionary income. In fact, many of our teens don't have jobs, one of the big reasons they are on social media so much. But, while Twitter has been a teen favorite, that's changing. Adults are realizing the power of the Tweet now. This should send the stock back to the old highs of $70 per share soon. That's roughly a 40% return from today's stock prices – not too shabby for a stock that was once considered washed up. 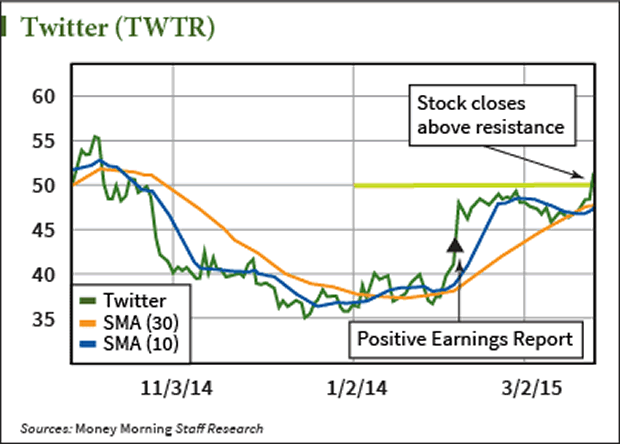 Buy Twitter at today's price best price, which as of this writing is around $50 per share. Hold it until it hits $70, at which point I plan to exit. And, while that may sound attractive, there's a way to potentially supercharge that return into the three figures. That's possible because Twitter has a low correlation to other stocks. In fact over the last year Twitter has only followed the Dow Jones Industrial Average 18% of the time, and the S&P 500 just 22%. In previous articles I have referenced the use of call options, and in the case of our Twitter play it's really no different, with one exception. Remember, options are a powerful trading instrument and allow traders the opportunity to make money on a stock without actually trading the stock. I've mentioned a few of the advantages of using call option before, but let's highlight them once again. Make money with less money spent up front. With less money used on the option trade you have less risk on your overall account. Your return on investment dollar for dollar on the option trade is usually higher – more bang for your buck! But, options are riskier than stock in the sense that they are what is called a fixed time investment. The option contract has an expiration date and that is typically the third Friday of the month whose expiration you purchased. For example, a May option will expire at the close of the market on the third Friday of May. On more liquid or actively traded stocks there will be option contracts listed for every week of the month. Our example is going to utilize an option expiration of January 2016… giving us plenty of time to be right! Twitter is definitely one of the most popular stocks, and its day-to-day movement can be a problem for an options strategy. Because the volatility of Twitter's stock means that its option premiums are way too expensive. So how do we take a position in Twitter while keeping our cost low? Easy: We offload some of our risk to some other guy. That is, we will "spread" our risk with an options strategy called a call spread. A call spread is a bit different than an outright purchase. Yes we are going to buy options, but we are also going to sell options to someone else to help finance our purchase. We are buying the January 2016 calls with a strike of $60, but look how expensive they are. At this rate, if the stock gets to $70 I only make 100% (terrible, huh?). But, if we finance our trade by selling the same amount of 70 call options to someone else, we lower our overall cost and risk, in return for being obligated to deliver the shares to them at $70 if they desire. Think about it… I have a right to buy Twitter shares at $60 and I could be forced to sell it at $70… I would take that deal all day long! So the worst that could happen is Twitter shares go down, and I lose the $423 I paid for the 60 calls, but I make the $194 that I earned from selling the 70 calls. The best case scenario is that TWTR goes up and I have to sell at $70-something, while I have a right to buy at $60. That's a 10-point profit or $1000 per contract, minus my total investment of $229. That's a 336% return on investment! Spreads like this take a bit of time to understand, but if you want to trade big movers such as Twitter like a pro, I will teach you how.